This page shows the different makes traditional Old, Antique & Contemporary rocking horses manufactured throughout history. Rocking Horse Identification - this page shows the types of Traditional Old, & Antique rocking horses from various makers including, F H Ayres, G J Lines, Leach, Smith, Collinsons & Sons, for your interest. Some of the different makes of rocking horses are shown in brief on this page. There are further pages that go into more detail with photos to help you with rocking horse identification. These information pages include the main makers F H Ayres, G J Lines, Haddon, Collinson & Sons. Please click on the following links for more in depth information. A very fine example of a rocking horse manufactured by F H Ayres. This example is known as a 'D' type & these were carved with significantly more detail than some of their other horses produced, to include extra carving on the legs, neck and rump. These horse also were given a realistic wither & dock with carving to mimic muscle definition along their spine. This old boy has a turned & twisted head & also an unusual long tongue. His original paintwork is in exceptional condition. F H Ayres Extra carved rocking horse. Another 'extra carved' F H Ayres rocking horse' & his restorer has given him a very sympathetic restoration conserving a lot of his originality. Restored to include retaining his original paintwork & saddlery preserved, with replacement stirrups, reins & bit. His replacement saddle cloths were copied exactly the same from his original, in a vintage pure wool fabric with genuine antique gold fringing the same as Ayres used back in the time. His cows hair mane & tail, although replaced are as he would have had back in the time. It is lovely to see all his wonderful old metal Ayres rosettes in tact, which have taken on a green/blue patina. Quite often these are lost. 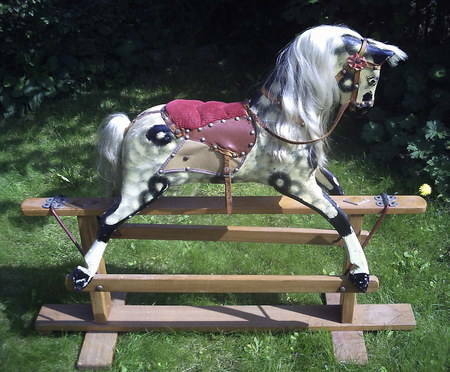 A fine example of another antique rocking horse with her paintwork in original condition. This rocking horse was carved by G & J Lines, notice her beautifully dished face and flared nostrils. G & J Lines rocking horses have a noticeably more feminine look than the F H Ayres rocking horses. Another lovely example of an antique G J Lines bow rocking horse fully restored. Her restoration included preserving her original bow rocker, glass eyes & also her metal mouth piece. It is nice to see that she retains her original Caledonian badge to her chest & both stirrup irons. Her carving is typical of G & J Lines with a beautiful dished face & flared nostrils. 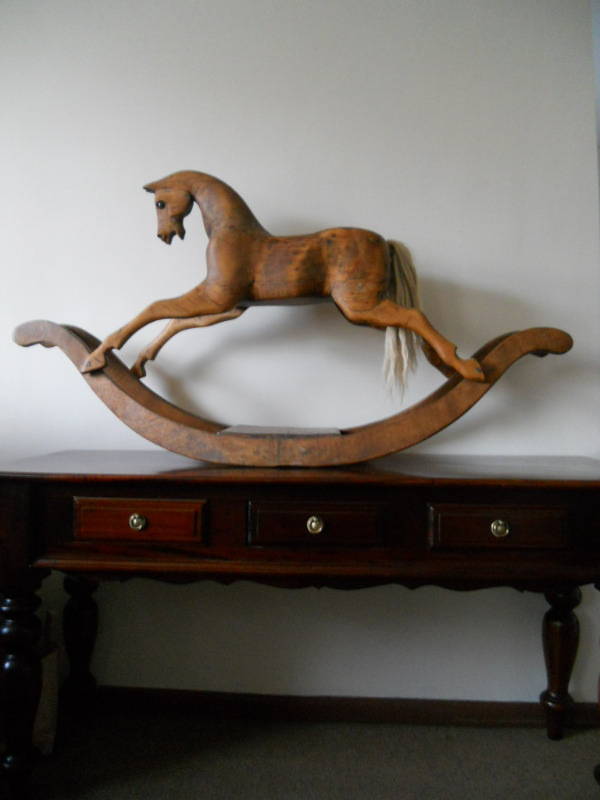 A really lovely example of an antique rocking horse on a bow rocker by JR Smith. An antique rocking horse by Brassington & Cooke on a bow rocker, fully restored to include new paintwork and saddery. A fabulous example of a rocking horse attributed to manufacturer Paul Leach / Leach with much originality. 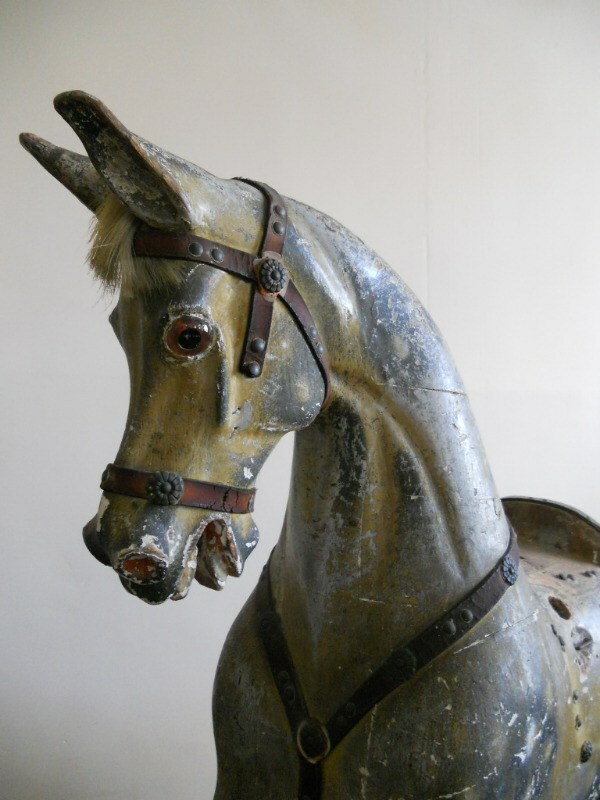 Another example of a rocking horse attributed to Leach but this time unrestored and in overpainted condition. A vintage rocking horse by Collinsons (Collinsons & Sons) of Liverpool. Very similar to G J Lines this is an example of an antique rocking horse by Woodrow. 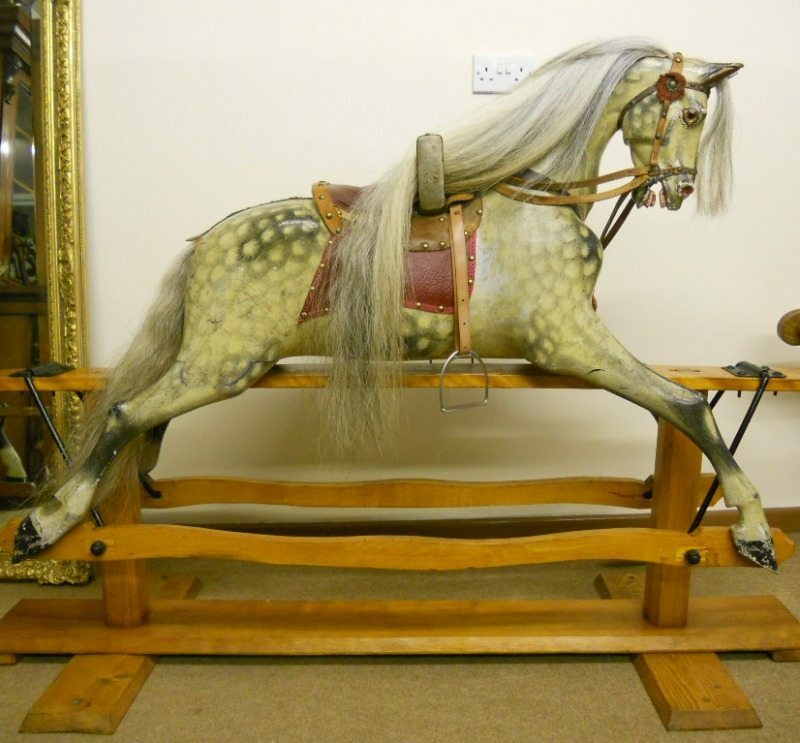 A vintage 'Sportiboy' rocking horse by Lines Bros. (Lines Brothers) With much originality. Pickles is the smallest Lines bros nursery rocking horse seen to date. Shown in the photo with worn paintwork on original swing stand. 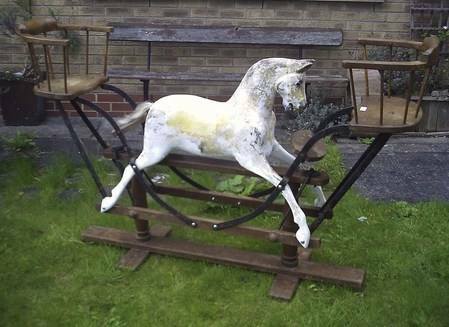 A large Haddon Vintage rocking horse in the 'Nursery rocker style' which is a bow rocker with end seats. Haddon rocking horses are generally constructed from fiberglass & the moulds taken from various antique rocking horses, to include F H Ayres & also Lines. 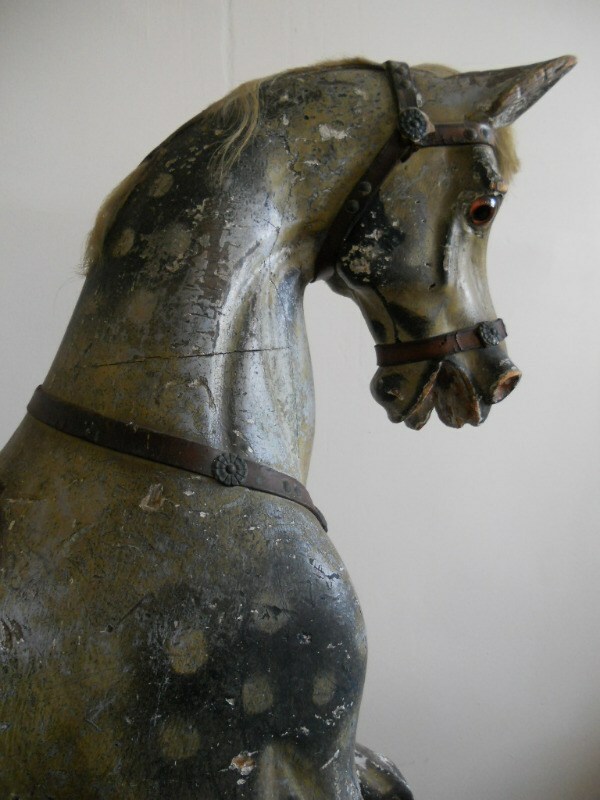 This particular rocking horse has been moulded from a cast taken from an early G & J Lines rocking horse & he comes dressed in full eventing saddlery including a running martingale. Circa 1970s, is one of Haddon's earlier models. Another Haddon rocking horse this time taken from a cast of an antique F H Ayres rocking horse and the photo shows him undergoing refurbishment to a realistic finish. Antique rocking horse by Crossley Bros. 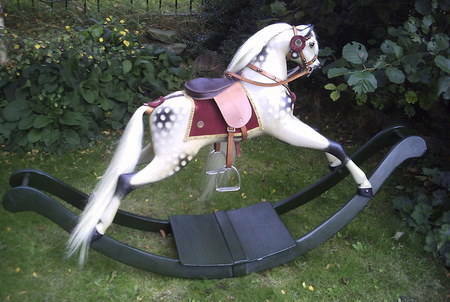 Antique bow rocking horse by Parker with original paintwork that has been lightly restored. Ragamuffin rocking horses are constructed from fiberglass with the stand being made of wood.